The series is set in Richmond where Irish born Michaela (Mic) McPherson, a former Richmond homicide detective, her retired police dog Angel, and best friend and side kick 82 year old Italian Countess Dorothy Borghase are up to their ears in solving crime that requires quick thinking and ingenious solutions. 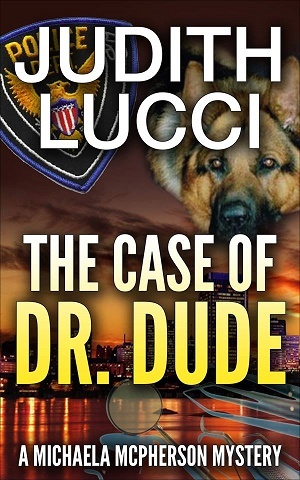 The Case of Dr Dude: A Michaela McPherson Mystery is a private sleuth mystery written by Judith Lucci. Michaela was enjoying her retirement from the police force and had finally opened up Biddy’s Irish Pub in honor of her parents. She still remembered sitting in her dad’s pub and her enjoyment in being the pub owner’s daughter. Her friend and fellow sleuth, Dottie Borghase, who was a real live Italian countess, had other plans. She enjoyed their sleuthing work together too much to give it all up. Besides, there was a pressing problem that required their attention. Allison Massie, the granddaughter of Margaret and Beau Massie, Dottie’s friends, never came home again after her interview with Dr. Nicholas Smirkowitz, otherwise known as Dr. Dude, the dentist to the stars. Allison had just finished her schooling as a dental hygienist and was considering dental school. Dr. Smirkowitz was a talented cosmetic dentist, and she hoped to get a feel for the business first-hand by working for him. Allison’s parents were still en route from Europe, and her grandparents were getting frantic. Their granddaughter was diabetic, and her survival depended upon her receiving her insulin injections. Michaela knew all about Dr. Dude and had even been a patient of his at one point in time. She also knew he had had a number of complaints lodged against him by both his patients and his staff. Now, she and Dottie were racing against time to find Allison. Judith Lucci’s private sleuth mystery novel, The Case of Dr Dude: A Michaela McPherson Mystery, is exciting and fast-paced. While it’s not the first book in this mystery series, Lucci gives enough background information to allow this book to be read as a standalone novel. The interactions between Dottie, the octogenarian armchair sleuth, and Mic are grand fun, and Lucci’s plot addresses a real and pressing crisis that is ongoing -- the trafficking of children and women. Angel, Mic’s retired K9 companion, often steals the limelight in this taut and well-written novel of suspense, and that’s just as it should be, it seems. After all, he did take a bullet in the hip in order to save Mic’s life when they were on the job and, even when retired, takes his guardianship of her quite seriously. The Case of Dr Dude is the first Michaela McPherson mystery that I’ve read, and I’m looking forward to reading about her other detective cases. It’s highly recommended. Click The Image and Go To The Reviews Now!!! Click The Image To Go To The Book Tour Hop and Visit all the stops!